Situated just 7km (four miles) south of Southampton, our Island is approximately 37km wide and 21km from north to south (23 x 13 miles). 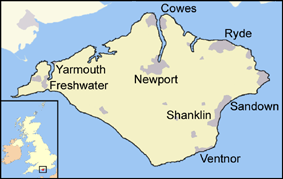 Islanders usually call the county town, Newport, the Island capital. There are 96km (60 miles) of stunning coastline with chalk cliffs in the south-west leading to the Needles and extensive marshlands on the north and east coasts. Culver Down, between Sandown and Bembridge, is the eastern end of the chalk downlands that give the Island its spine. There is a rapidly changing landscape and a wide variety of plant and animal life in a very small area. There are 150,000 residents but the population doubles during the main holiday periods. Popular destinations are Sandown, Shanklin, Ryde and Ventnor. West Wight is the quiet part of the Island and attracts photographers, walkers, cyclists, kayakers, paddle-boarders and surfers. The slower pace of life compared with the mainland gives the Isle of Wight a slightly old-fashioned feel to everyday life. The mild climate and record hours of sunshine have led visitors to call our Island the Garden Isle. People come to enjoy the shady lanes that wind their way between rolling fields to sandy bays and a sparkling blue sea. Places of historical interest include Osborne House, Queen Victoria's private holiday home where she welcomed her family including grandchildren from Germany and Russia. Carisbrooke Castle is where King Charles 1 was held prisoner before his execution and the start of Britain's short-lived period as a republic. The official tourism website is www.visitisleofwight.co.uk. .